There’s no faster way to bring new skills into your business, than to attend one of our practical, jargon free workshops. There’s so much more to LinkedIn than job-hunting! With 25m users in the UK, LinkedIn is the best place to target business owners, professionals and senior decision makers while they’re in a ‘business mindset’. It’s the perfect platform for finding clients and growing your business – but it can be tricky and overwhelming if you don’t know the best way to use it. Join us for a half-day session, 100% focused on turning LinkedIn into a game-changing, cost-effective marketing tool for your business. How to grow your network the best way, by finding and connecting with the right people, so you can start attracting good leads and secure new customers. How to use LinkedIn to uncover the critical information for your business, without wasting time on irrelevant or boring stuff you don’t want to see. The best way to present yourself and your business on LinkedIn so your personality and brand shine through. Professional doesn’t have to mean ‘boring’ – work that profile! Our Top Time-saving Tips and Tricks to help you maximise your time on LinkedIn, and free you up to get on with your day job. Spend a couple of hours with us now, to save HOURS of wasted effort in the future – book your spot now! Book your place now, they won’t hang around for long! What our clients say about working with us on their marketing…. If you are an SME and considering using an external agency then you really must think carefully about The Marketing Architect. I love these guys! I knew that I wanted to rebrand and had decided on the focus of my new business (coaching senior leaders to improve their presenting). However there were many parts of the jigsaw I was missing. Pip and Sian listened really carefully to me and offered me the help I needed to get clearer about my new brand and business focus. I am in the middle of rebranding now and really enjoying the ride. I have been involved in running my own businesses for 20 years. I know a few things about selling but am no expert in marketing. They have educated me, cajoled me, challenged me, introduced me to the right people, and always with a supportive and creative adult to adult mind-set. I feel very privileged to be working with Pip, Sian and the rest of the team. Their guidance, optimism, action orientated focus and openness have been and are so important to me as an SME looking to retain work, win new clients and spread the word. I wholeheartedly recommend the team to anyone thinking of using marketing professionals. Professionals come in all shapes and sizes – these guys are the real deal. I was delighted to offer a written testimonial and if anyone wants to contact me directly to find out more, then drop me a line. They feel part of my team and they deserve to build a great reputation as the go to marketeers for SMEs who want to get ahead. It’s for small business owners who know that LinkedIn could be a good marketing activity for their business, but they aren’t sure how to get the most out of it. Who will be presenting the content? What can I expect to leave with? A clear understanding of how to present and promote your company on LinkedIn in order to generate new business. We suggest you bring a notepad and pen, or a laptop / tablet if you prefer, to take notes on. The Dome cinema is situated on the seafront in the centre of Worthing, served by many bus routes. There are several public car parks within a five minute walk of the venue and some onstreet (meter-controlled) parking in the immediate area. Water, tea and coffee will be provided during the morning (oh, go on then, we’ll make sure there are some nice biscuits too!) 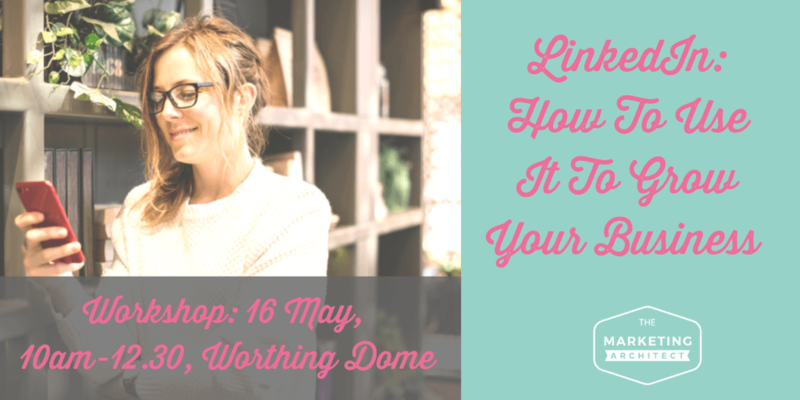 If you’re looking for somewhere to go for lunch after the workshop, the Dome has its own ‘vintage tea rooms’ on the ground floor, serving tea, coffee, cakes and light lunches. There are also plenty of cafes and restaurants within a five minute walk of the venue. We can offer a refund if you cancel up to 7 days before the event. After that time we cannot provide refunds, but if you are unable to attend please feel free to pass your ticket to a colleague or friend or contact us for more information on other options. Can you help with other social media platforms? Yes! We can provide training on Facebook, Twitter or Instagram too – get in touch for a bespoke option.